A lot of my focus on sleep paralysis and its related night visions has been on how to transform fear into curiosity. Then a reader recently commented, “I can’t believe no one’s talking about the out-of-body experiences!” So let’s open the dialogue, because this is one of my favorite aspects of SP/HH, although I make no claims to OBE mastery or the final say on the “reality” of soul travel. The excerpt includes a couple tactics for inducing OBEs from sleep paralysis, as well as the role that expectation and fear can play in their unfolding. 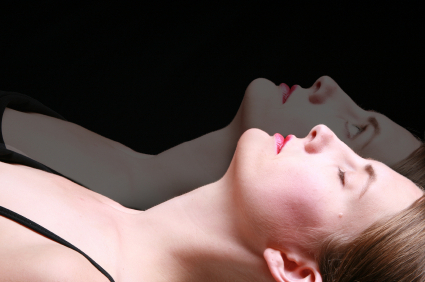 The experience of being out-of-body has been recounted for thousands of years. Whether you believe that the soul is actually separating from the body or that it is a simulation based on sensations from the brain, out-of-body experiences (OBEs) are highly linked to sleeping and dreaming states.81 Many people start their journeys while lying in bed, and when the experience is over, they wake up safe and sound. Sleep paralysis is a reliable launching pad to an OBE. The powerful feelings of being crushed, twisted, or pulled along are a good indicator that you can separate your mind (the “I” or the seat of your personal perspective) from these bodily sensations. According to SP expert David Hufford, OBEs are more likely to emerge after SP experiences that last at least 2 minutes. I hear a rushing sound in my ears; it comes and goes like ocean waves. I focus on my ears so the rushing increases; it comes back in longer and longer durations. Finally, the rushing sensation is constant and I hear a distinct tone as well, like a bell. I try to move but cannot. “I am in sleep paralysis,” I think. I then try to move out of my body. I try to go up but it seems blocked, so I kick myself out to the left and down. It’s an odd sensation; my “me”leaves a part behind. As soon as I’m “out,” everything changes. It is quiet, cool, and dark. I feel like I’m drifting down a stream. I have a small fear arise, and then, I relax into the sensation… it’s very calming. Some lights like stars are overhead. My breathing is slow and deep. After a while, I decide to go back. I wriggle my little toe (which I cannot see because I am still floating down a dark river!) but the focus brings me back. After a few seconds, I can move and I open my eyes. Note how I calmed my fears, noticed my breath, and finally used the tried-and-true toe wiggle method to wake myself up. With a little practice, these techniques become second nature. This tactic was devised by Jorge Conesa-Sevilla. When you are in SP, focus on your belly. Specifically focus right underneath the navel. Now imagine your body is “rolling up” into that spot. If the feeling of pressure increases just on that spot, but nowhere else, then you are doing it right. When the pressure increases, again use your attention to just “roll” out of your body. You may feel a “pop” as the mind dissociates from body feelings. From here, you can go on to have an out-of-body experience or simply wake up from the dream. This method works for a friend of mine who is an advanced dream adventurer. When he feels he is in SP, he focuses his intention by concentrating on the spot between his eyes, and then, he tries to do a sit-up. Of course, he’s in SP, so he can’t actually sit up. But if the intention is strong enough, rather than waking up, you can “pop” right out of your physical body and float around. OBEs are weird. Even veteran explorers of the inner worlds saythat OBEs feel different than the usual dream. They feel more real than real. Sometimes, you may get scared, especially if you start floating off into the sky and have the thought, “What if I never come back?” Like many aspects of conscious dreaming, your beliefs can greatly affect your experience. Sometimes our beliefs can be limiting (“That’s impossible!”), but they can also be grounding (“I trust that I cannot be hurt because I am dreaming”). Unexamined beliefs are the wild cards: These act as subconscious expectations that can really hijack a conscious dream. Take a moment and reflect on what you believe about out-of-body experiences. Do you believe in a soul? Do you believe in life after death? What about reincarnation? Are you in fear of a final judgment? Is the OBE a trick of the brain, a “virtual reality” owing more to synapses than to souls? These are the kinds of thoughts that can greatly influence your OBE, negatively or positively. Sometimes, an unexamined belief can actually cause a serious crisis of faith in the middle of these experiences. So, the more you have considered these deep questions, the more comfortable you will be in this profound altered state. When all else fails, wake up! Just like a lucid dream or SP proper, you can will yourself to wake up whenever you want during an OBE. Control your breath; control your fear. Also, focusing on one point for a few moments is a good way to disrupt an OBE and lead you closer to snapping back to the “real world,” whatever that means anymore. Got any other tactics for inducing OBEs from sleep paralysis? Please share below. 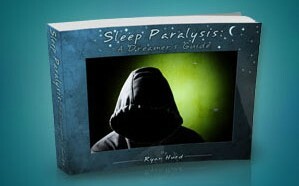 This article is an excerpt from my ebook Sleep Paralysis: A Dreamer’s Guide. I had an SP experience recently, and as I’m not that used to it, it scared the hell out of me. I had fallen asleep with my foster dog Rocky (he’d been very abused, and my home was his last chance – turns out he’s lovely and was just scared at the shelter – we bonded within a few hours of his arrival at my house) asleep in my lap – something unusual for this dog. I was mostly alarmed that I could not move my hands, or that I wanted to and couldn’t? In the dream, I called out to Rocky to help me. Funny, especially, since this little guy has a nerve injury and his back legs are very weak – but he’s scrappy as all get out. A few minutes later, I remember being awake, and Rocky was still snuggled in. Do you have any recommended methods for deliberately inducing SP? I’ve tried the SaltCube method once, and it worked beautifully. Every time since then, I haven’t gotten it to work, and just fall asleep. I’m really looking forward to reading your book, provided that I am ever able to find time to read for pleasure ever again. It’s been difficult lately. You’ve probably addressed this at some point in your career as a blogger, but is there a propensity in families towards SP, OBE, and lucid dreaming in general? Both of my parents can recall their dreams in vivid detail, have experienced SP, and my dad has had at least one OBE that I know of. He also claims that his grandmother’s spirit appeared to him the morning after she died. On the other hand, my husband’s family never seem to remember their dreams or have experienced anything that could be described as “otherwordly”. Do you think the types of dreams/visions we have and our ability to remember them could at least partially be explained by genetics or is it more to do with the significance we attach to them? The mind is such a powerful, beautiful thing!!! My SP episodes used to be overwhelmingly terrifying, and now they are unearthly fascinating. I look forward to the next time it happens, thanks to all of the positive vibes and beneficial information I get from this website and your dedication to spreading the SP word. Thanks Ryan!!! I’ve had a few obe experiences mostly initiated directly from sleep paralysis, and I find that over thinking my method can really create hurdles for me. A few times, when I have tried rolling or floating out, I have found myself stuck halfway, and I think this is because the process I’m thinking through is not spontaneous enough. When I get into SP, I try to focus my attention on where I want to be rather than how I’m going to get there. I tend to experience a noticeable consciousness shift and simply stand up and walk away from my bed/body, just as I would normally do in getting up in the morning. Danielle – don’t worry, SP still scares the hell out of me too… it’s extraordinarily creepy by design. Bill, I discuss some of these methods in my book but haven’t written about them on the blog yet. I believe the saltcube method is a variation of wake-back-to-bed? I’ll write a post @ this sometime soon — in general, it’s about encouraging REM intrusion, the easiest methods being sleep deprivation, REM deprivation, and various supplements caffeine or galantamine. Kate, dream researchers believe there is a genetic component to experiencing SP, but the research is pretty paltry. As for lucid dreaming/OBEs/weird dreams in general, I think it does run in families, but this could be the culture of the dreamer as well as something genetic. Gen, I have felt that stuck feeling too. I find that working with the energy of the dream is the way out (ie — where is the movement clear and easy? ), like you said, it’s that spontaneity that makes it possible. I have not personally done too much work with intending to go some place specifically, so your focus method is good info for me. This is the skill of remote viewing that the military has experimented with for decades.. with good results too. Also great to hear about your somersault method! I´ve been experiencing sleep paralysis since I was a teen. I have it quite often but, no matter how hard I try, I am not able to go further (go beyond it and turn it into a lucid dream)! I’ve experience SP so many times. It’s always followed by OBEs that range from horrifying to hilarious. I’ve tried to induce SP, but I’m never successful, I just have to be incredibly tired. When it occurs, it’s as if a freight train in my head and it gets so loud, it’s all I hear. My entire body begins to buzz and vibrate. It seems like the frequency keeps going higher and higher. I’ve done my best to play with these sensations, but it’s such a thing I can’t really describe. I’d love to find another way to get out of my body. Seems I like to roll out – and fall. That feeling of falling out of bed, or out of my body is very unpleasant. I feel myself hit the nightstand – the ground. But then I am free. And that is the best part. But falling is preferable to being “pulled out” which happens on occasion. That sensation is always coupled with a “visitor” or feeling that someone(thing) else is with me and the fear level goes sky high. But those are the times that are the most profound, and I learn and see things I may never have any other way. When I can get past the fear, which has become much easier over the years, SP and OBEs can be fun, pleasant and rewarding. Looking forward to reading more on your site. Keep up the good work! I too have an out of body experience in Sleep Paralysis. I just feel that I am coming out of my own body and walking slowly in my home. I try to touch things but cant hold them. I cant grab anything in hand. Its an amazing experience. I’m very spiritual, have been for a long time. My house is haunted we believe, by ghosts that are very unfriendly to children. Ive had what I believe to be episodes caused by this, yet mum puts them down to sleep paralysis and vivid nightmares. I have slowly secured off to sleep, woke in a state of lucid dreaming. Partially into this my dream changed and I lost control, faces started rushing at me and a cackling laughter started. I couldn’t breathe and my pupils were fixed and I was so scared, so desperate to get away that I passed out of my body, trough two walls and into my parents bedroom. I’m an insomniac. I’ve also always suffered with horrible nightmares that I can’t remember, and will have spooky conversations with people in my sleep. I also remember thins before they happen, creepy. Any advice? Building courage in this stage of sleep is important, and over time you will benefit mightily from this hard work. My dad died in september 2010, and ever since then my mom has been having OBEs. In these obe’s my dad comes and holds her and hugs her. She asks him questions and he answers, all but one, she asks him if hes made it heaven yet and he stares at her, he hasnt went yet. She had one last night where he hugged her tight about 6 times and then told her he was going to fix him some cereal. Last week my sister was wide awake and said that the bathroom door which was all the way open slammed shut. These obe’s could be the spirit of my dad tring to tell us something. regardless, they scare my mom to the point she crys. She moves in wierd ways when she has one, like shes tring to reach out and then she rocks herself awake. She thinks shes going crazy. What can i do about it. I’m sorry that your comment got past my radar for so long. I think your mom is doing what she has to: meeting your father in the dreamscape, grieving, and finding comfort. These visitations are part of the process of grief for some people who are prone to sleep disturbance and big dreams. She’s not going crazy, I assure you. Feel free to contact me if you have more to tell since it’s been a few months. I dream I can fly. It is so real. Actually, it is more like I can ride the air. I soar all over the place. The beach, country, places I have lived. These are the most vivid and realistic dreams. I wake up and it is hard to believe I was dreaming. I also experience sp. I wonder if they are connected? This is exactly what happens to me. Im asleep and i feel my body floating towards my bedroom ceiling. I can feel the bed covers as they slip off me as i rise higher, ifeel cold from the loss of the covers and its all my bedroom, my partners in bed as it happens. Ive had this dream recurring for about 2 years, i wake myself up screaming ajd terrified! What does it mean?!?!? Last night I think I experienced this. I thought I turned on my side and opened my eyes. (Now that I have thought about it I don’t think I did.) Anyway, I felt like I (my body) was being pulled down and I was trying to move and wake up but couldn’t. While that was going on I heard like ocean waves/shushing getting louder. Then as I was close to waking up I felt like I was floating above my body at the same time I was being pulled down. If that made any sense? This felt like it happened in 30 seconds or something close to that. From what I’ve read about SP and OBEs today I’m pretty sure this is what happened. As all this happened I “watched” myself being pulled to hell and I heard a strange voice tell me “The devil will always test you.” Can anyone explain to me what this means? Any of this. The other morning I woke up with sleep paralysis. I’ve had it many times in my life but never knew what it was until now or the possibilities that it could lead to. The idea of having an OBE is intriguing, but ever since I found out about them I haven’t been able to sleep. I’m worried about what may happen while out of my body.. can something bad happen to me while in this state or am I just afraid of the unknown? So interesting to read all of your posts! I used to have many episodes of sleep paralysis when I was in my teens. The first time it happened it scared me half to death — I didn’t know if I’d ever wake up. But I never had an OBE (didn’t even know SP could lead to one) and now I haven’t had an episode in years. I feel like I missed out! In my opinion, OBEs are dreams. They cannot hurt you. I would love to explore one. I DO have frequent episodes of lucid dreaming, and one thing I enjoy doing is confronting people in my dreams about the fact they are figments of my imagination. They nearly always admit to it. On occasion I have asked them to give me a message — something deep from my unconscious mind. The answers I get are pretty meaningless though. Oh well. Still fun! So ive had sp a few times.. Every time i hear things. Once i hears my bf’s little sister talking in the other room while i was paralysed though she wasntthere. Last time inwas partially awake on my back.. I was hearing a high pitched frequency unlike the night before while i was fully awake and hearing a very lowfruequency in my head..this highpitch was getting louder but not too noticable.. I then realized i was in sp and triedgetting out of my body. Suddenyl i heard shoes squeking around on the tile outside the bedroom.. Getting louder and faster as i began to panic. I felt a prescence and started sayin in my head st michael protectme.. The footstep came up to me buti could see no one.. I screamed in my head ST MICHAEL, GAURDIAN ANGEL, HELP ME! then silence. Then at the same time i heard and saw “theres nothing you can do now”. And then i fully woke up feeling emotionless yet paranoid.. I just experienced SP that lasted for almost an hour. When it happened I chose to leave my body and explore, yet when I separated from it I no longer could go back. I stayed in my house and experienced hallucinations which constantly tried to distract me from efforts to wake myself up. I would repeatedly enter my body in the aim of moving it but would fail to do so. I was even preparing myself to accept the possibility that I may be stuck and I might never go back. Does anyone know what it is or did anyone experience any difficulties coming back as well? This morning I had my third SP. I became interested in Lucid Dreaming about a half year ago and I realized that I had instances in the past when I was aware that was dreaming but I never really explored the possibilities. The first time was really scary. I couldnt move my body but when I tried, it felt like something was holding my arms down and then like I was being pulled by my feet along my bed. The pulling sensation was very strong and when I fought against it, it became even worse. However I managed to slightly open my eye lids and soon after could move again. The second time I again was really scared and even began hyperventalating when I again was being pulled over the bed. I woke myself up by moving my fingertips and toes. After that I read alot about SP and read the tip that I shouldn´t fight the pulling but rather go along with it might become an OBE. So this morning when i realised I was in SP I was thinking to myself: “I will not fight it, I will not fight it…”. Again I felt a pulling sensation but this time it was upwards. Additionally if felt a strong tingling and warmth in my chest area. Then I felt something like a pop and ascended upwards, about half a meter above my body and turned 90 degrees sideways. While this was happening it felt like somebody was blowing in my ear and I heard an unkown female voice, though I couldn´t make out any words. This again was a bit frightening and I felt myself descending and turning back into my physical body and awoke. Though it was brief I was happy to have experienced my first OBE. The next time this happens I will try opening my eyes after leaving my body and moving. I hope that I will have longer Lucid Dreams or OBEs in the future. Sorry for the very long post, but I really felt like sharing and I don´t really know to whom I can talk about this. I’ve never experienced SP until recently (a few times last couple months). However, I don’t have the frightening hallucinations people report. Instead I have a weird dream that incorporates what my presumably open-eyes are seeing while in bed. It only happens in the morning when I wake up or after waking up, dozing off to sleep and waking up again. I sort of just drift between dreaming and trying to wake up and have a random hard to remember confusing dream during the time. Interestingly, I have recently woken up in this SP state with eyes closed feeling a sensation of weightlessness. Having been long interested in OBE’s I woke up like this recently and thought “this could be an OBE launching-off point. . .” Long story short I had an two episodes. The first one I focused on relaxation and fell the ‘vibrational’ state and as I willed my head to leave my body I heard the classically reported white-noise wooshing/hissing sound (also kind of ‘felt’ this sound) I got really excited and then I felt the separation stop with my excitement. Tried it again recently and same sound occurred was really feeling the separation and wanted to see if I was out of body so I forced my eyes open. What I saw was a mixture of images and then I just woke up, not in SP. In my experience the more you try to physically “force” an OBE by movement or eye-opening you wake up. You have to really relax for it to work. Paradoxical I know. However I have read that you should try “imagining” vision instead of forcing your eyes open in order to see. I’ll give it a shot next time it happens. I’m starting to be able to become lucid right before fully awakening after a nights sleep and can enter into an enjoyable SP state or just wake up if I want. Perhaps SP people that have difficult experiences might benefit from keeping their eyes closed and just relaxing in the weightless-state? hello. my name is Jolene. i grew up in a haunted house. i know because i had my two kids. a girl and a boy. Apparently i named all of my stuffed animals ONLY their names. I cannot remember their names unless i am back on the property. I lived there until i was 12. I had 3 “dreams” in that time. Two were a one time thing…i once thought there was an ice cream cone floating over my bed. I went to grab it and woke up. The other was …i went to the bathroom and sat down and began to pee…i immediately woke up in my bed. Embarrassed and confused. Both were in black and white and flat..in dimension. The two children who i felt lived there, came to me. The only “dream” I ever had was of these children coming to get me and when they did we would go! We would turn into (what i described as a child) cigarette smoke…off of the cigarette the thick smoke. we would run..twist and turn and finally come to a stream. We would join the stream and eventually end up in the meadow. It was a beautiful place and there was a weeping willow that we would spend days playing under. I would wake up in the morning and it would be the next day. Still all in black and white. No senses involved. No touch, taste, smell, or hear. we all communicated without words. I would sometimes wake up and immediately be scared because i couldn’t move. I (as a child) described it like i was in between the mattresses and everyone i knew were laying on the top mattress. I couldn’t move a finger. I don’t remember how i ended that feeling..only that i remember it. I think I called my kids..and it stopped. I had many memories of these kids growing up. I once was under the house (my dad was repairing something…and there was a crawl space. I guess i took off. (This is what i was told by my dad). I without a flashlight made it to a part of the the maze..that was the under part of the house and was found my my father. I was holding a arrow head that had the two names of the two kids i always talked to on it. My dad wanted to show my mom..he believed me. My mom didn’t. I said no. It had to stay there. That was them..to me. So to this day. They are there. I just saw some of what you were saying and just thought I would share my self. I moved from that house when I was 12. I had my first real dream at the age of 14. Scared the crap out of me. If you are interested i will tell you more. I have been searching online for about an hour now trying to explain what happened last night. I usually go to sleep while meditating and listening to my meditation music. The next thing I remember is floating with my head right at ceiling height. The room looked slightly like mine but the ceiling was much higher. I remember seeing a light outside my door down the hallway. I started to get scared and tried to struggle against whatever was suspending me. I couldn’t move and started to try and scream for help. I couldn’t scream either. then I slowly started decending back down to my bed. Once in my bed I continued to try and struggle against something I felt was binding me. I was able to loosen it then my eyes opened. While looking around my room I felt everything looked about the same as a few minutes before when I was in the air. I checked my phone to see if it was time to get up and it was only 10:30pm (I went to bed around 9pm). I do believe that OBE’s are very real but the only thing that keeps me from thinking this was one is the fear I felt. I’ve read up on OBE’s and for a while tried to initiate them for a few months straight about a year ago. I’m not an expert in them but I have read a LOT about them. This past July after moving into my new apartment about a week and a half before two finals for my summer courses, I experienced sleep paralysis for my first time. I have been a vivid/lucid dreamer since my early teenage years, but in recent years the dreams have been becoming more clear and memorable. I can recall precisely the series of events that unfolded last July as if it were yesterday; futhermore, my Mom and my little sister also report having incredibly vivd dreams which makes me wonder if there is a genetic component to this ‘control’ or sensation. I am not a very spiritual person and I had never heard of sleep paralysis until finding out after the fact what had happened to me. It was very terrifying because of the intensity and the overwhelming reality of the situation. It was as if a dormant pathway linked to a deep-rooted childhood memory associated with an image that troubled me as a child was reactivated and a terrifying being was walking slowly toward the foot of my bed. I could hear the baseball game (with announcer commentary) I had been watching in the other room in the background and none of my other roomates were home. I began to panic as the ‘being’ (which I can only describe as an undead subadult of sorts with hair covering or concealing most of his or her face) approached my bed and the panic only intensified as I found that I could not move a muscle in my body; the panic heightened as the being climbed ontop of my chest and began to press down on my ribcage, which made me feel like I was slowly suffocating. It was one of the most terrifying and surreal moments I can recall in my life. I was fighting with myself, trying to regain physical control of my conscious self never having had to try so hard to move any aspect of my body; it was as if my neurons were firing from the CNS only to not meet the energetic requirements for subsequent synapses to fire at the presynaptic neurons (that was what was going through my head during the dream, as I had just taken an in-depth anatomy course the prior spring). Eventually, after struggling for what seemed like forever, I recall standing near the doorway looking down on this being on top of my physical body in disbelief as what was occurring (since I am not a very spiritual person). For how long this OBE lasted I am not quite sure but the next thing I knew I felt that I was back in my body and sat up in my bed gasping for air. I dismissed this occurrence initially as my subconscious playing a ‘trick’ on me. However, I came down with a fever (about 102 degrees F or ~39 C) the following morning and was very sick with a sore throat and what the doctors could only determine to be a virus of some sort for the remainder of the week. Last week I woke up after having a very intense lucid dream and was yelling and sweating, with my heart racing. This is another very course intsensive semester for me (I’m in 2 separate organic chemistry courses as well as a biology course and a genetics course) and I had the most certain feeling that I was about to slip back into that lucid dream with that same ‘being’ coming after me. However, this time I feel as if I had triumphed either it’s or my subconscience’s will to overtake me once more. I feared while in my dream that if I had allowed such an event to occur that I would become sick again, and do not wish to have any more SP occurrences in which I am the victim and powerless to some sort of being. I would like to be able to control the occurences that take place in future SP incidents, and was wondering if there are any tips for someone who doesn’t exactly try to provoke these types of occurences, but rather has always just had these types of lucid/vivid dreams? Ok. well, I started having out of body experiences for the first time. Last week I came out of body, sat up in bed (my true body stayed in bed), got out bed and realized I was out of body. As I turned to look at my body in bed, I became too scared to look at my face. I wanted to wake up. Then I realized I was paralyzed. I tried to scream for my wife but couldn’t. I woke up scared stiff moments later. This experience had me too scared to go to bed for a few nights, and i had to force my thoughts elsewhere when I did, in hopes of not having a recurrence. Well, as a grown man (34) I realized that I need to overcome my fear. I told myself last night that I would try again to have an OBE and not force my thoughts elsewhere. Sure enough, I “awoke” and sat up out of my body again. Unfortunately, my true body was lying on its side. I did not perceive this when sitting up. This made my “spirit” or consciousness or whatever very disoriented. I couldn’t move correctly. I fell out of bed (not my true body, but my “spirit”). I couldn’t stand up and was very confused. I again became scared and tried to scream for my wife (which again did not work). I was in paralysis. This time I did tell myself that I knew what this was. I was less scared. I didn’t even mean to wake up, but I did. I felt a very dizzying feeling as I came awake, still on my side in bed. I will try again tonight. My body and my room and my bed are all as they are in real life while having these experiences. I noticed while in this state last night that my bathroom light was on, which it was. I am aware and conscious and can think properly, aside from the crazy fear that I hope will subside. Am I going nuts? Is it possible to take this further? A friend of mine told me to look for a hole in the ground and crawl in it if it happens again. I don’t think I want to do that. Neither time did I get to view my sleeping self. The first time I was too scared, the second time I fell to the floor. Have you or anyone ever been able to speak in such a state? I had a similar yer different experience about a month ago. My brother died recently and I went to sleep with a picture of him in my arms. I usually get scared in the dark, something I’ve always had… so when I am alone I put on a nightlight. That particular night however, I felt safe and decided to put out the light and go to sleep with my brother’s picture. I cannot say how much time has passed after I fell asleep, but I regained counsciousness (I was still asleep I know that and weirdly I know that my eyes were closed but somehow open at the same time) because I felt like someone has put a very heavy blanket over me. That was the first abnormal feeling that night. And then I looked at the end of my bed and someone, or rather something stood there, I think I could best describe it as a hooded creature with greenish fiery eyes who patiently stood there and looked at me with expectation. I wasn’t scared by it, I just didn’t know what “it” expected of me. A few moment passed and the creature pulled another, heavier, blanket over me and at that point I got scared because I realized I couldn’t move anymore. The creature disappeared and a very loud humming came out of nowhere. I felt like the whole room was vibrating it was very powerful and then I realized it was coming out of my chest. The moment I realized that I reveived this “images” best compared to “sound waves” black and grey who were moving rapidly before my eyes and then the pulling sensation came. I felt like my soul was being pulled out of my body and then I got really scared and wanted to scream, fight,… but nothing happened. I could not localize the creature or anthing else, I just imagined a bright light coming out of me and then I woke up, turned on the nightlight and that was it. The first week after, the moment I went to bed I felt the paralysis coming up but I fought it off. I would lie very close to my boyfriend and touch him. The thing is that I hear a very highpitched noise in my ears and then I can feel the density of the dark increase and I know it might happen again. But thus far, luckily, it hasn’t happened again. Should I be scared? Who it the creature? Have you heard similar experiences? I had the floating/dragging dream today. Like most people, the setting was my room. It is unique to have a dream where the setting is the room you are sleeping in. That seems to be a common factor with this type of dream. Anyway, no floating this time, just the sensation of being dragged and pushed off the bed and to the floor, behind the bedside table, and across the room. My body is completely limp and i cannot move. In my dream I was convinced that a ghost or whatever was responsible which is odd because i don’t believe in ghosts or am religious in any way. I wasn’t scared at all and was actually relaxed and enjoying it. As well, i remember being able to look out my bedroom window and saw and heard my neighbours talking. Strangely, it was summer in my dream and it’s the dead of winter here currently. I opened my eyes in the middle of being dragged a few times and saw my clock and was out of the dream. When I closed my eyes, almost instantly the dream was “reset” and i was back on my bed and getting dragged off in a different direction. I haven’t had a dream of this nature for some time. Last one I was floating up to the ceiling and back down to the floor. Swore someone came into the room and stood in front of me (i was on the couch) and i could not move or talk to this shadowy figure. What is unusual for me as well is that these dreams never occur at night, but only when i am fortunate enough to be having a mid-afternoon nap (2pm to be specific). And not long naps either. Less than 40 min. The crazy dream starts almost instantly too. I love it. I love the feeling of the motion without locomotion and defying gravity. These dreams are so few and far between and i enjoy the sensation so much that I hope it happens to me when i have a nap. Not sure why this happens or what it “means” and i really don’t care. It isn’t a ghost because there are no such things. It isn’t a demon or angel or nothing like that because that stuff is just fairy tales. It doesn’t mean i’m feeling overwhelmed or forced to do something i don’t wan’t to do in life. I can’t buy into the notion or relating dream scenarios with real world emotional or physical issues. No co-relation there but what people want them selves to think. It’s something going on within our conscious that seems to happen to a lot of people. The “scenario” (floating, dragging, flying etc) is relatively the same among people. The individual “content” is different though. That leads me to believe that it is just a neurological thing that happens once in a while. I don’t really understand it, but whatever, I don’t have to. I just need to have a nap and enjoy.